Producing a talking head video can potentially be one of the best investments you or your company make as part of your marketing endeavours. 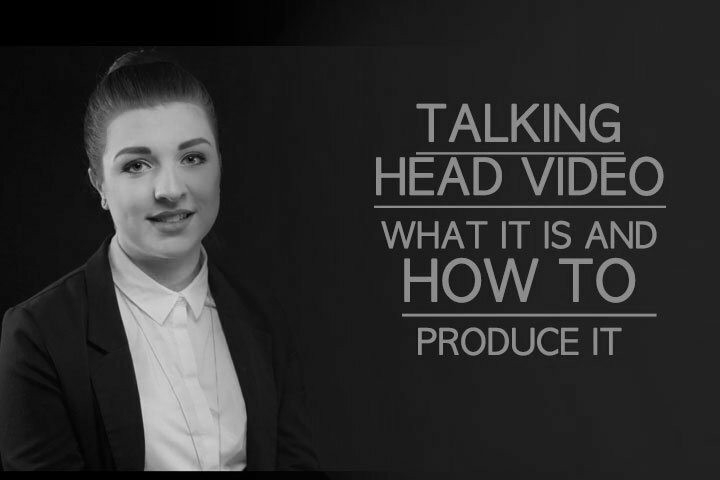 In this blog post we will share some useful tips about producing a talking head video. These will be handy if you produce it yourself as well as if you are working together with a professional video production company. Talking head video is a video where visually we can see mainly a close-up of a person (head and shoulders) who is talking about a certain subject. The person can be filmed talking directly into the camera or can be filmed from the side which will give impression that the person is answering questions from an off-camera interviewer. In most simple talking head videos there will not be any other footage at all except for the person talking. In more complex talking head videos some cut-away shots or animation explaining the talking points can be used. This is one of the most popular and probably one of the oldest corporate video formats as it is relatively easy and affordable to produce and is also one of the most efficient ways to communicate with your audiences. VERSATILE: Talking head video can be used for many purposes such as testimonials, internal communication and others (which we describe further in this post). Also if you produce several talking head videos as a series on one subject you can later use them as part of a longer video. AFFORDABLE:Talking head videos are relatively more affordable than other types of videos to produce as they require very simple technical setup, short filming time, no actors etc. You can start with talking head video which can be later incorporated into more complex videos when your budget becomes more flexible. TELLS A STORY: Talking head video is a great and simple way to tell the story behind your product, service, project or cause. EDUCATES: Talking head video is a great way you or experts in your company or organisation can inform and educate your audience about specific topics. PERFECT FOR INTERNAL COMMUNICATION: Many kinds of internal communications can often be done in a form of a talking head video. BLOG: It can be a fresh addition to your written blog. Talking head can also be one type of video used in series of vlog videos. TRUST: It’s a great way to build trust as people can see representatives of your business or organisation as if “in person”. Corporate Video Production V2 from CineEye on Vimeo. Before doing anything else ask yourself if talking head video really is the type of marketing tool that you need to use. Think about what is your target audience and what is the purpose of the video. And then decide whether a talking head video is the right medium to convey your message to your audience. It is ideal for those companies and organisations just starting out to use video for their marketing purposed, but in some cases talking head video cannot fully convey an idea, story or feel (where a more elaborate video will be required). Who should appear in the video? In an ideal situation you should find someone who is good at public speaking, who can memorise text easily and who possesses a certain level of natural charisma. Authenticity is everything for a talking head video. The more natural the delivery of text, the better the video will be as there are no many other effects that can compensate for lack of on-screen charisma. The best way to get a natural sounding delivery for a talking head video is to talk freely without learning scrip and without using autocue/teleprompter. In this case the presenter can prepare some key points themselves and then just talk freely to the camera. Alternatively your marketing manager or video production company representative can prepare interview questions and ask those off camera. Autocue/teleprompter can be useful if you have no time to prepare or if you have large amounts of specific information to deliver. But if at all possible try to avoid it. As mentioned previously – reading from teleprompter in most cases results in artificial tone. And authenticity is very important especially for talking head style videos, where not many other cinematic techniques or effects can be used to offset unauthentic sounding delivery. Finding the right location is crucial for a talking head video. The right location will it make the video look visually appealing. Location also conveys information about the subject being filmed. Filming in personal home conveys different information than filming in a corporate office or library. It is also important to find a location that is large enough to have some room behind the subject. This will give a visually more appealing look as the cameraman will be able to use more shallow depth of field ( with subject in focus and background out of focus). If you are producing the video yourself try to get at least a point and shoot camera or DSLR as well as a tripod. Using some semi professional or professional lights and a microphone will also make the end result look and sound better. It is certainly possible to shoot a decent looking video on smartphone, but you need to do a bit of research and learning to really do it the right way. And know your limits – if you are not a technical person, don’t hesitate to take services of professional video production company. Contracting professional video production company will save you time, nerves and also delivery better looking videos. There is not much seen visually in a talking head style video apart from the presenter. Therefore wardrobe, hair style and makeup of the presenter is crucial. The wardrobe should be appropriate to the subject matter – CEO of a multimillion company will probably dress differently than a creative freelancer advertising their local service. There are certain types of clothes that usually look unappealing on video. Those are for example clothes with close repeating patterns. Hair grooming is also important as this really makes a big difference regarding how a person looks. Makeup is optional, but it is advisable to have at least some powder with you in case there is a need to reduce any shininess of face. A professional talking head video will usually be shot with two cameras. In this way during editing it is possible to cut from close up to a wider shot. You can also choose to position the cameras with different angles towards the subject so that you capture both a portrait shot and a three quarter angle shot. But it is certainly possible to shoot a decent talking head video with one camera. It will simply require multiple takes and will take a bit longer time. If you produce the video yourself you can try to use natural light. In this case it is essential to position your subject correctly. Avoid using window light as backlight. Shooting with a window behind you will make you look like a silhouette. It is safer to shoot while the subject is facing the window. In this case try to also use a lamp and direct the lamp towards the subject’s back. This will make the subject “pop out” visually from the background. If you position the subject with the window on the side then don’t forget to even out the lighting by pointing a lamp towards that side of face which is in shadow. Common problem with natural light is it’s unpredictability. The clouds can come and go and thus it is not easy to make an evenly lighted video using natural light. Therefore if you can afford it use services of professional video production company. They will use special lighting setups. This way your video will get that smooth pro look. Remember – light is probably one of the most important elements of video, so you really should prepare yourself and educate yourself about proper lighting techniques before shooting the video yourself. Going with a pro video production company will save you the time and hassle of learning all the technicalities of lighting your video properly. Talking head video without a good quality audio is wasted money and time. To get proper audio for your video it is important to find a location that is relatively less noisy. Avoid places where traffic can be heard or where other people are talking loudly. If you work with professional video production company they will most probably use external microphones or even employ a professional sound recordist. If you produce video yourself it is advisable to invest in some sort of external microphones. Getting the audio quality right is very important in order to make your talking head video feel professional. Shooting is just the beginning. You still need to edit your talking head video. There are many editing software around and they are enough straight-forward to learn easily. Adding some graphics such as title and animated logo can be beneficial. An unobtrusive background music will make your video even more professional and interesting. Although not impossible, it is not easy to learn to do these tasks on your own. In many cases it is better to focus on the pressing tasks and goals of your own company and to delegate video production to a professional and affordable video production company. Thanks for sharing this helpful information. Is it really important to use more than one camera for shooting a talking head video? I am a little bit confused about it. If you shoot yourself, you will probably only have one camera. And it is absolutely possible to shoot a talking head video with one camera. You simply have to shoot it in several takes – each take from a different angle. If you will work with professional video production company, then most probably they will shoot with one, two or even three cameras in order to capture several angles of the same scene in one go. There is no set way – it all depends. I want to say thanks to the author for this article, and especially for including the video. How long should be a talking head video? Can you give me ideas about the length? Statistics from Youtube say that most views are gathered by videos which are only 1-30 seconds long. But it is not always the right strategy to create such short videos only. Talking heads videos in particular are not the most “creative” videos and are designed for delivering large amounts of information, therefore they will generally be 1 minute long or longer. For example if your video is an internal communication video, then it can be even 3-5 minutes long or even longer – your employees will always be more interested to watch the video from beginning to end as opposed to general public with shorter attention span. So as you can see – the length of talking heads video really depends on the subject and the goal you want to achieve with it. This article was great! In my opinion, a perfect talking head video should also include a good story and be performed by a talented on-camera performer and storyteller. It is also important to create the video specifically for the media on which the video will be viewed (large, medium or small screens).